I wrote this brachah on the occasion of my son Oryah’s bar mitzvah. The Aramaic/Hebrew and the translation are mine. My partner and I recited the blessing after my son was called up to the Torah. 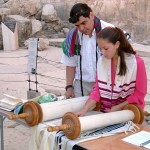 The brachah replaces the ברוך שפטרנו which is recited in some communities. This blessing (which is basically self-explanatory) expresses gratitude for Divine favor leading to this moment and a prayer for Heavenly guidance for my son’s continued path. Though the translation is gender neutral in relation to God, the Hebrew/Aramaic is gendered masculine. This is my practice with regards to my children. I bless my daughter with feminine God language and my son with masculine God language. The blessing can be grammatically adapted for a bat mitzvah. . . .